7 Wonders (it is our go to game) Scales well, you can play it pretty quickly almost no down time. Plus when my son goes science we can bury the science cards as wonders and get under his skin. Survive: Escape from Atlantis! This is mostly because it is a ruthless game. My son's girlfriend is the expert in this game. But mostly we like to kill each others meeples, especially with the squid. Carcassonne My wife loves Carcassonne and so do I. Two player Castle is our favorite. We have all the expansions for the base game and it takes multiple hours to play it. I also like the following games. I really like worker placement games but I also like conflict. The game should scale and have at least 4 players, 5-6 would be even better. I have some geek gold so geek gold to great suggestions and to whomever makes the suggestion of the game my family gives me for my birthday. Thanks in advance for all the wonderful suggestions. This awesome worker placement game has some really great quirks in it and the theme has justly made it a favorite with my family. It is worker placement but I am unsure if it has enough direct conflict for you. It certainly has disasters which can really mess with players if you play with the samurai cards. We love it and it scales really well. If you don't mind a long-ish playtime, this is the ultimate worker placement/conflict game. Slightly more complicated (and in my opinion better) version of Titan: The Arena. And, let's face it: What's not to love about shoring down people's ships and killing their worlds? Nice worker placement, and the D&D theme is cool. Since you have a lot of other classic Euros, I figure I'd include this one. Has an area control mechanic somewhat similar to Samurai (if I remember correctly). Recommended also because the conflict can get delectably brutal. Carson City combines worker placement and conflict well. So this would be a suggestion of mine, but I think some folks would suggest to you Tzolk'in: The Mayan Calendar(as it is immensely popular right now), though I have yet to play. Perhaps Caylus? I dunno, just basing this on some things you do and don't have in your collection. Le Havre was already there and ranked pretty high by you. And HAPPY BIRTHDAY to you! Good gaming! 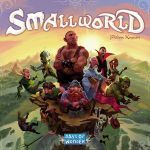 Small World could be a great choice. OK, it's not worker placement (although you place lots of tokens on the board during game), but has tons of replayability (especially if you add the expansions), scales well from 2-5 and is a lot of fun. I would recommend Keyflower. It is a combination of bidding and worker placement mechanic. There is a need to prioritise and decide which tiles and actions are more important since timing of placing the "worker" is important. Late placement may mean that you need to spend more "workers" or even unable to take the action due to lack of "workers". There is sufficient interaction/conflict among the players especially when bidding for tiles. Replayability for the game come from the different "colour workers" that players randomly draw at the start of the game. We have played this game twice and enjoyed both experience. We are planning to get a copy of it ourselves!